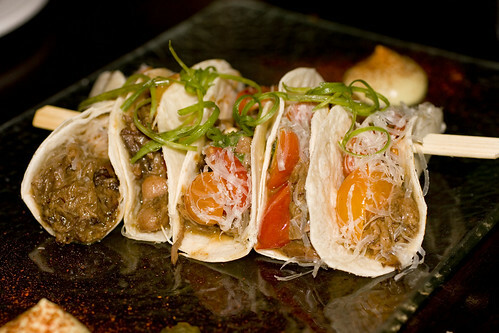 The Stanton Social 99 Stanton Street, New York, NY 10002 has an interesting menu that seems to draw inspiration from everywhere, American classics to Asian inspired to Latin influenced. The tapas sized dishes are meant to be shared and for certain dishes they can accommodate to the size of your group (with a pro-rated charge). Everything sounded exciting and new, so we ordered a little more than recommended (which was 7 dishes for 6 people). 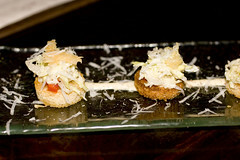 An amuse of Ceasar Croutons arrived first, which I would’ve completely forgotten if we did not have the photo evidence. Lon ordered a Peach Margarita which was interesting because they put a lollipop in it, but otherwise also completely forgettable. 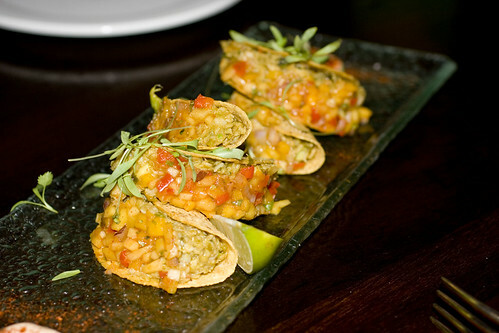 The Red Snapper Tacos were densely packed and pretty tasty, not quite memorable but good for the moment. 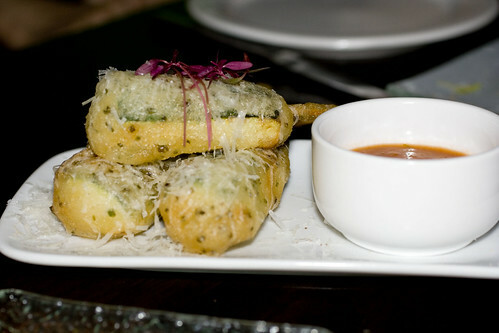 The Zucchini Tempura, served on sticks, is tender yet still al dente, but there isn’t much of a taste to it. The tomato jam is desperately needed. 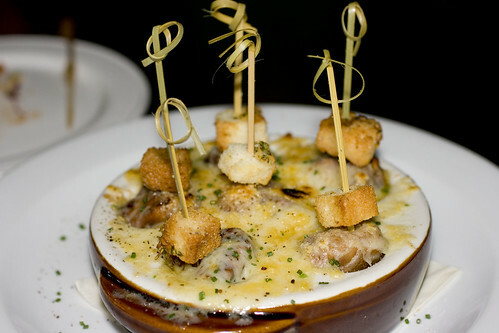 The French Onion Soup Dumplings are such a clever idea, but it has a operational issue. The dish is served piping hot, which is perfect for me, as I down the sweet caramelized onion filling that plays with the cheese in my mouth. But, for most people, they have to wait till it cools a bit, but by then, the cheese has become a layer of plastic that they just peeled off. 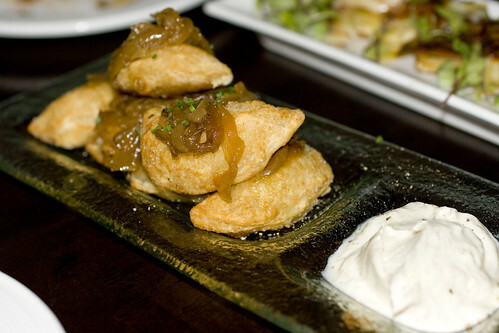 The Potato and Goat Cheese Pierogies were pretty good, not oily for fried food. There’s the initial crunch, then your teeth sink into a bit of good doughiness, and then comes the creamy soft filling that fills your mouth. They’re a little sweet but it hits the right spot. 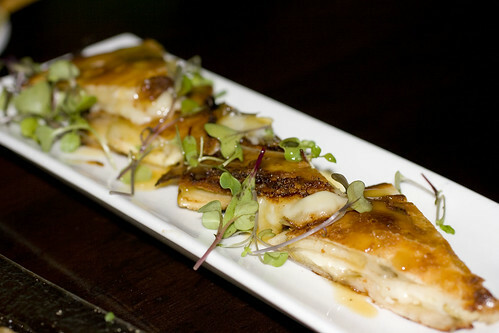 The Grilled Apple and Brie Quesadillas didn’t taste like much other than just cheese. My mom asked if it was pizza. The Sliders were the biggest disappointments because they are sold by the piece. 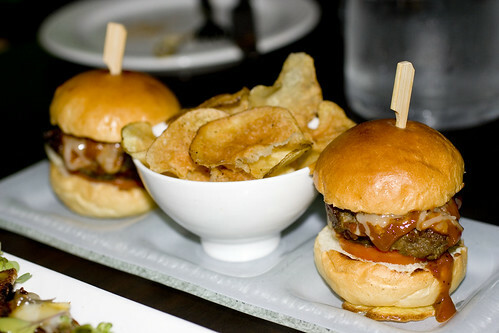 Each of these mini Kobe burgers were $7 and they were terribly over-cooked to the point where it was crumbly. There’s a ton of ketchup on it and the chips were another sub-par toss-in. The Short Rib Soft Tacos were pretty generously filled with meat but the flavor was very one-dimensional, just salty saucy meat. I can see now in the picture that the flash revealed how unevenly the condiments were dispersed. I barely got any of that relish; I had eaten the first taco on the left. So, to side track a bit, we used flash because it was incredibly dark inside and because we were the only ones on the mezzanine floor. I realized at the end of our meal, when I went to the bathroom on the second floor that the second floor was brightly lit and had room for more people. Now I got incredibly annoyed because I specifically requested to be seated wherever there was more light. The mezzanine floor was where there was least light, the first floor being only slightly better, and the second floor being well-lit. We had a really hard time even reading the menus and my parents were uncomfortable. Back to Chicken & Waffles. The Brick Pressed Chicken should be given credit for remaining moist, but the dish did not come together. The chicken did not help the waffle, the waffle did not add to the chicken. 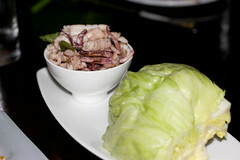 The Charred Squid Lettuce Wraps was probably one of the table favorites. 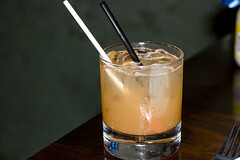 I enjoyed the tender curls and even liked the hint of mint. 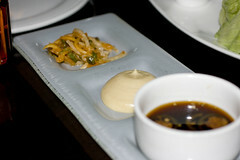 The condiments were all nice additions, a jalapeno soy, miso mayo, and papaya kimchi. In the end, we weren’t quite full, but no one was really interested in ordering more. The bill was already $163 (tip not yet included) and it was really more for 5 people since Sophia, a vegetarian, didn’t find much to eat besides the zucchini tempura. I noticed that everything vegetarian was covered in cheese so if you don’t like cheese that much, as in Sophia’s case, you can’t eat here. There is some great plating and presentation of wonderful ideas, but it becomes abundantly clear that The Stanton Social is really meant more for those that want to see and be seen, than those who just really want to taste. posted by jessica	at 08:24 AM	Filed under Fusion or Mixed, Restaurants. You can follow any responses to this entry through the RSS 2.0 feed. Both comments and pings are currently closed. 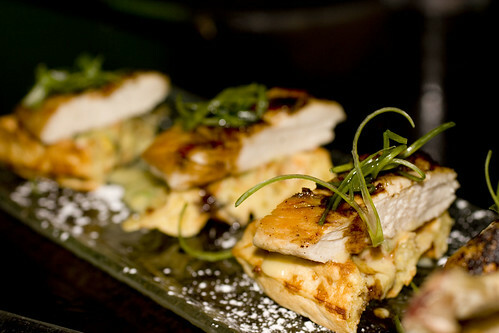 I love the idea of the brie and apple quesadillas… too bad they weren’t great. Sounds like a case of style over substance! your pictures are beautiful! the food looks delicious! looks like a fun restaurant, except you get very little food for quite a bit of money! hehe. There are some good things there and the atmosphere is nice but the food is grossly overpriced given the portion size. I don’t understand why people would call this food for sharing when you don’t get any value by ordering more. Anyone can order 5 orders of something and put it on a big dish. This is not sharing. This is just ordering a lot. Also, since we were not hungry after $300 of food, we went to get Vanessa’s dumplings nearby which was cheap and delicious.